32kms of sand dunes, nothing but fun! No waves to ride? Need your adrenelin fix? No problem… just grab a board and stick it on a massive pile of sand, then slide downhill, really fast. It’s not rocket science. 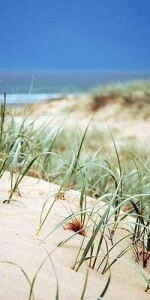 The dunes at Stockton Beach, which runs between Newcastle and Nelson Bay, are gigantic. Some are over 30 metres. The gradient will send you down fairly quickly once you’ve jumped off the crest. If you absolutely must fill all your clothes and orifices with sand, Stockton Beach is the place to do it. It is Australia’s largest sand mass. Years of winds, currents and coastal erosion managing to dump massive ammounts of sand all in the same place. At 3500 square kilometres, it is a big playground and a magnet for 4WD enthusiasts and quad bikers, plenty of whom can be seen zooming past, bobbing up and down the yellow hills. Stockton Beach is also home to the wreck of the Sygna, a Norwegian bulk carrier that smashed into the coastline in 1974, battling unsuccessfully against winds of up to185km/h. Half of the ship is still there and can be reached via a short drive along the beach. Depart Sydney for Port Stephens in an air-conditioned mini coach. Travel across the Harbour Bridge and past the towering sandstone cliffs of the Hawkesbury River. Arriving at Williamstown, commence your 4WD trip to the stunningly beautiful ‘Desert by the Sea’ sand dunes and beach at Stockton. Travel to Port Stephens for lunch at a spectacular local restaurant. Fresh seafood is on today’s menu. Relax overlooking the picturesque marina. After lunch join a dolphin watch cruise in the calm waters of the bay. The expert crew bring pods of wild dolphins into view with a 97% success rate at finding dolphins. Return to Sydney by approximately 6.00pm. Stockton Beach has long been the playground of dune buggies, motorcross bikes and 4WDs. Seeing and driving on the dunes of Stockton Beach for the first time is a real delight. If you enjoy driving on the sand dunes at Stockton Beach, then you will need your Recreational Vehicle Area Permit for such activities. These are available at a number of outlets in and around Port Stephens, including the Birubi Beach Service Station, Gan Gan Road, Anna Bay and the Birubi Beach Caravan Park in James Patterson Street, Anna Bay.